“Basement waterproofing is the answer to any homeowner’s nightmare of a leaking, damp, or flooded basement. Even if a basement does not have a water problem today, most will develop leaks and moisture problems sometime in the future. Considering the inevitable, prevention is the cheapest alternative in the long run, instead of paying high repair bills later. New Jerseyans can relate to what Wetzel is saying, as the Garden State is battered by surges and storms, with Hurricane Sandy being the most brutal of them. Several homeowners near the coast may have had some nasty scrapes with badly protected basements. If your house’s basement is in a not-so-good shape, experts at basement waterproofing in PA like Vulcan Waterproofing can help you create a solution to prevent future basement problems. Cracks in the basement usually appear when the pressure from the water buildup pries open the wall and floor joints. Wetzel says water buildup can be attributed to shorter downspouts, a flat-sloping lawn, or shrub concentrations that pool the water around them. A temporary solution to this is to set up longer downspouts, and to angle them away from the house and the lawn. The next step is to get an experienced and dependable basement waterproofing contractor to study the overall condition of the place. The company can prepare a detailed quote for various options you can take. 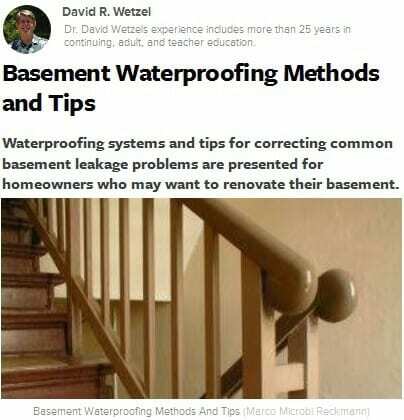 Wetzel says there are treatment strategies worth giving a shot to save your basement. A sump pump is central to the treatment choices for your basement, which may include French drains and PVC baseboards. The sump pump will be linked to an outbound conduit for the water. The French drains will collect the water leaking through the wall while the hollow PVC baseboards will channel the water collected at weep holes to the sump pump. Moisture buildup may also prompt the installation of basement ventilation. When your basement is badly in need of waterproofing due to storms and surges that often occur in your area, count on Long Island basement waterproofing experts like Vulcan Waterproofing to find a way for you.